In the comments to F1 Fanatic's post, 2008 Malaysian GP preview: Lewis Hamilton vs Heikki Kovalainen, Wesley was kind enough to point out that I was correct about BMW being better than their winter testing times had indicated. And I admit that it's nice to get something like that right - it makes one look quite the expert! But the reality is I don't really have a crystal ball and all my "predictions" are just educated guesses mixed with a dash of optimism. In fact, everyone does it that way and the difference comes in where they get their information from and how much weight they give each source. I am sure that we all have our preferences amongst information sources, believing what one guy says and taking a pinch of salt with whatever another maintains. 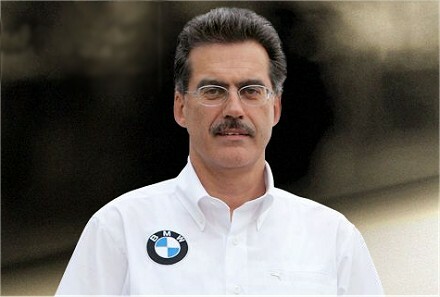 It should come as no surprise, given that BMW is my favorite team of the moment, that I respect and listen to Dr Mario Theissen more than any other talking head (ambiguity intended) in F1. When the good doktor speaks, you can be sure that he is telling it as he sees it - but you have to read between the lines to understand the full extent of his rare utterances. Take his most recent interview with Autosport as an example; there are more indicators on his expectations for the year than appear at first glance. "Theissen believes the key to his team's chances of success will be in matching the development rates of the top two teams." Now that's a fairly standard statement that could have come from the mouth of any of the team managers. But Dr Mario also says, "...it is important to keep contact to the top teams and then work through things. We need to optimise our car step-by-step and then at some point this season I am confident we will be there." That is an indication that he expects BMW to be at least level with the big two before the season has ended. So the intent is not just to keep pace with the rate of development of the big boys, it is to exceed their pace and eventually to get ahead. That's a huge ambition but the Dr would not be talking of it if he did not think it possible. He is nothing if not a realist. How can he be so confident? I think the answer rests with the new car, the somewhat maligned F1.08. After initial disappointment in the handling of the car, the team has worked through its problems and become aware of the developmental possibilities it contains. From being worse than last year's model, it has already improved to the point of being the third, and possibly the second, best car so far. At that pace of development, it will not be long before it is the equal of the McLaren. Note, too, that Theissen reckons Williams to be a serious threat to BMW's position. Forget Red Bull, Toyota and Renault - the greatest danger comes from Williams. This is the kind of thing on which I base my prediction that BMW will be serious contenders this year. I hear the opinions of the drivers and other team managers but it's the good doktor's statements that are the really decisive points. There are others, too, that I listen to rather more carefully than the rest. Pat Symonds of Renault is a good source of realistic information on his team and Toyota's Pascal Vasselon is always worth listening to on the state of F1. But I'm sure we all have our favourites and on these choices our predictions will be built. So it's Nick Heidfeld for champion in 2008; but I'll hedge my bets with the Williams suggestion for the team trophy. I agree and I think Cosworth will have the best engine and Goodyear will have the best tyres although I expect Michelin to be better in the wet. That's a mighty big assumption that Heidfeld in a BMW, if it manages to compete with a McLaren, could beat Lewis. I'll eat my keyboard if that happens! Now that's the kind of bet I like, Arnet! So, if Heidfeld gets the championship, you eat your keyboard; if he doesn't, I just eat humble pie - seems a pretty good deal to me. Hey Arnet, I wonder what would have been the case if Lewis was in BMW and Nick in Mclaran?? (in one parallel universe, of course), and Clive, Nick has always pleased me in being a better race driver than Kubica.. So far, so good, Arun. Heidfeld retains an edge over his team mate in race conditions. But Kubica is young and learning all the time - I do see him becoming quicker than Nick at some stage. I just hope Nick can hang on long enough to get the championship he deserves (and also so that I can say nyaa nyaa na nana to all those who predicted Hamilton or Raikkonen for champ). I think you are the 1st person who's wishes are like mine, in the whole freaked out world!! Go Nick!! Go Nick! Nick for Champion! I think that if I wanted something that worked well, was reliable and methodically approached I'd ask a German to do it for me. Guess where my money is ? Maybe not this year, but certainly over the next couple I think we will see BMW emerging as the F1 team to beat. It may not be a conventional choice, but I'd love Nick to win simply because he has the best accent of all the drivers and then I'd get to hear him speak more often ! Next year everyone will be going for BMW for champs. Since I refuse to be a herd animal, that forces me to go for them a little early (maybe). Der Deutsches are coming, there's no doubt about that; the question is merely when they will arrive. That A post was me, Arnet. Just so you know who's poking you in the eye-or eating a keyboard.